Paul Pogba was the star of the show in the last Manchester derby as his quick-fire double provided the catalyst for a remarkable turnaround. Manchester United had fallen 2-0 behind at the Etihad Stadium and were primed to be reluctant guests at City's title-winning party, but the Frenchman's second-half brace changed all that. After Chris Smalling converted to complete an incredible 3-2 away win, both United and Pogba had salvaged some pride from a season in which City ultimately claimed the bragging rights. But it was an exception to the rule, not only in terms of City's new-found supremacy, but also in Pogba's tumultuous second coming at United. Ahead of this Sunday's showdown between the bitter rivals, we track some of the key highs and lows of Pogba's Red Devils story since that last derby tussle in April. Immediately after that two-goal showing, Pogba was left in no doubt that he would have to produce the goods on a more regular basis to win over Jose Mourinho. "I don't expect you to be man of the match every week, I don't expect you to score two goals every week. But I expect you to be consistent," said the Portuguese. In his 17 Premier League outings since then, Pogba has scored four goals. Later that month, having been substituted in consecutive top-flight games, including a 1-0 home loss to West Brom, Pogba suggested he was "judged differently". "It is quite funny. I think I am judged differently," the France international told Sky Sports. "We judge me on assists and goals, we don't judge me on the midfield part. "I can make an outstanding game, but if I don't score or make an assist they will say, 'that is normal', or whatever. "But if someone else does it, it is different. They will maybe be man of the match. It makes me improve as well, it is a challenge for me and I take it in a good way. "I'll try to score and make assists and that's it. I still want to do my job in midfield. "If I can help the team in attack and defence and make a difference I will do it. If I can score and assist it is even better." Pogba scored in the very next game, a 2-1 win over Arsenal. After the season had ended in FA Cup final disappointment, pictures emerged of Pogba taking part in a photoshoot at the Eiffel Tower, prompting speculation that he could be weighing up a move to Paris Saint-Germain. Although Pogba said no such move was imminent, he did not rule it out altogether. "My presence at the Eiffel Tower has nothing to do with PSG," Pogba told Canal+. "Why not one day tread the lawn of the Parc des Princes? It's a beautiful stadium. "I cannot look far. I'm sure, contractually, to stay at Manchester United." When Pogba undertook media conference duties while with France at the World Cup, he shunned the conventional wisdom of skirting around questions about his club. Indeed, he went as far as to reveal he had "issues with Mourinho", hinting at a fractious relationship between the pair. "This year was a better season than last year as I was more decisive," he said. "It's also true that I had a big injury. It's experience. There were little issues with Mourinho, but they were nothing. "These are things that make you grow. I never had a season where I was pushed aside, or they put me on the bench. "It is also the choice of the coach, it's his job, I must accept, as I always said, the only answer is on the pitch." Having returned from Russia as a World Cup winner, Pogba might have expected to be in credit with Mourinho. Instead, Pogba's exertions on the international stage only gave his club boss cause to suggest he ought to be doing more for his employers. "I don't think it's about us getting the best out of him, it's about him giving the best he has to give," Mourinho told ESPN FC. Once the time for talking was over, Pogba was handed the captain's armband when the 2018-19 Premier League season began. He duly scored within three minutes and played all but the closing stages of the contest despite his energy-sapping off-season exploits. "Pogba was a monster," said Mourinho. "We thought maximum 60 minutes but he managed over 80. Pogba's own words were somewhat less conciliatory and rather more revealing, hinting very strongly at some significant unrest. When questioned over his future in September, providing a platform to express his commitment to United, Pogba was hardly emphatic. "There was a lot of talk, but it was just like that, I'm under contract in Manchester," the 25-year-old told German outlet Sky Sport. "My future is currently in Manchester, I still have a contract, I'm playing there at the moment, but who knows what will happen in the next few months. "We have a pure coach-player relationship, that's right. One thing I can assure you: I will always give 100 per cent, no matter which coach I always give everything for United – I cannot say more." 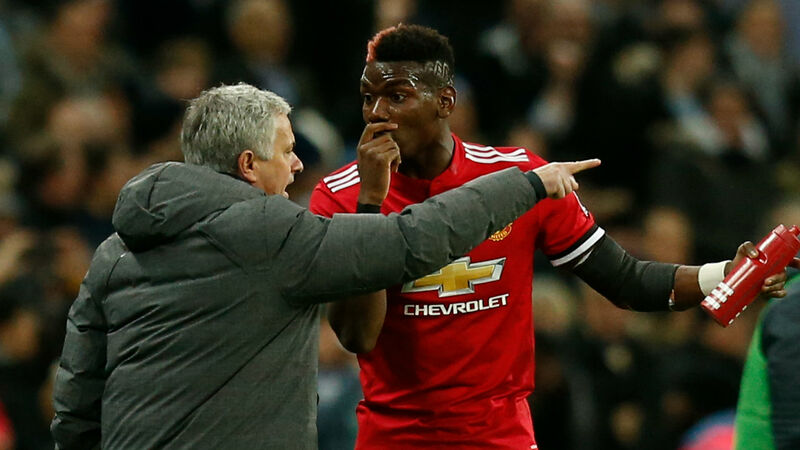 Things between Pogba and Mourinho appeared to hit a new low in late September, when the pair had a frosty exchange on the training ground. Pogba had been stripped of the vice-captaincy and the pair's evidently heated verbal exchange was captured on camera. "He's a player like the others," said Mourinho. "No player is bigger than the club and if I'm happy with his work he plays, if I'm not happy he doesn't play." In recent days, things appeared to have calmed down, with Pogba insisting any adjustments to his formal responsibilities had no bearing on his mood. "If he takes the armband away, it doesn't change anything," said Pogba ahead of United's victory at Juventus in the Champions League. "I just want to play, perform and give my best. It didn't affect me."